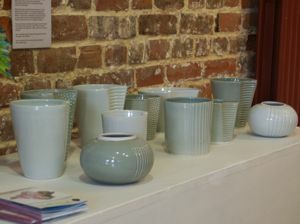 This year's summer craft show at the Quay Arts Centre is entitled 'The Blue Room'. The exhibition features work from local artists and is on blue theme. All of the work is for sale. Cat submitted eleven of her crescent shaped pots and all were accepted. The exhibition is in the Seminar Room at the Quay Arts Centre and the show opened on Saturday 24th July and ran until Saturday 28th August 2004. The Isle of Wight's geographical, administrative and artistic centre is Newport. Cat's studio in the Jubilee Stores is there. Newport is also home to the Quay Arts Centre. 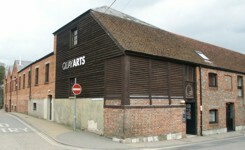 The Quay Arts Centre is the Isle of Wight’s leading art gallery and venue for live arts events. It is situated in a converted 19th Century brewery warehouse complex pleasantly located at the head of the River Medina in the centre of Newport. Facilities at the complex include 3 galleries, a 134 capacity theatre, a Crafts Council-listed gallery shop, a popular licensed arts café and numerous workshop spaces and meeting rooms. 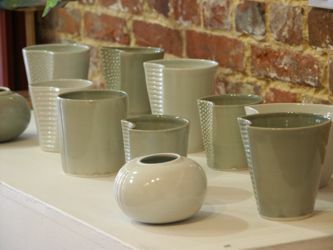 Many artists and designers sell their wares at the Quay Arts Centre shop; you can buy Cat's porcelain pieces there.